Welcome to the official website for Pritpal Singh Khalsa. Here you can find out more about Pritpal and his various activities: his Kundalini Yoga teacher training programs, his music recordings and performances, and about his Yogic-Life Coaching. Pritpal has been a student of Yogi Bhajan since 1972 and is a Kundalini Yoga KRI-certified Lead Teacher-Trainer, a Naad Specialist Trainer and is available to travel to your city to teach and/or perform. Pritpal has taught at locations throughout the US as well as traveled to Mexico, South America and Europe to teach and perform. Both Pritpal and his wife of over 40 years, Pritpal Kaur, who is also a KRI-certified Lead Teacher-Trainer, are involved in on-going KRI Level 1 and Level 2 Kundalini Yoga Teacher Training programs throughout the US and around the world. Pritpal Singh has been making music most of his life and has been producing sacred music recordings since the early 1980s. He is dedicated to sharing Mantras and selections of Shabad Guru (Sikh scriptures which take you from the darkness to the light) in a musical form that is accessible, lifting the listener to a state of higher consciousness. He has performed this music around the world and is available for concerts or courses. Pritpal Singh is a certified Core Dynamics life coach. Combining the subtlety of his sacred music with the meditative work from his yoga teacher training, Pritpal brings to his Yogic-life coaching work a deep connection to the flow of the infinite as it manifests in our finite lives. Pritpal also leads workshops on other topics such as Conscious Relationships, Sacred Sound, Meditation on Purpose™, and Embodying the Aquarian Masculine. Here are Pritpal's currently available recordings. Please enjoy them as you browse, and listen to and purchase any that you want. 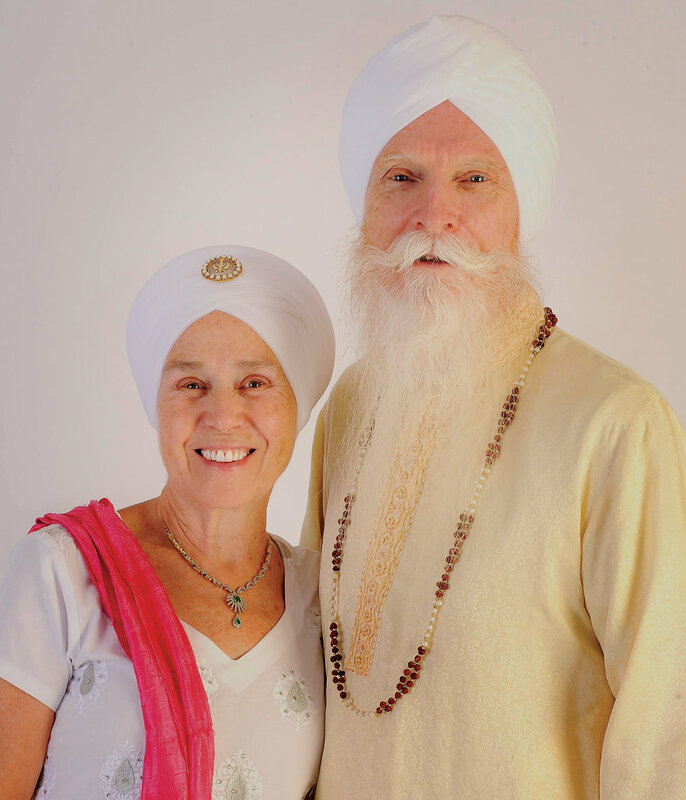 Pritpal Singh and Pritpal Kaur are both KRI-certified Lead Trainers of Kundalini Yoga as taught by Yogi Bhajan. We offer all three levels of the Aquarian Teacher™ program of yoga teacher certification as established by the Kundalini Research Institute (KRI). Our intention is to support both those students who wish to be certified so as to become professional yoga instructors and those who only wish to deepen their understanding and experience of the teachings of Yogi Bhajan. Kundalini Yoga and the teachings of Yogi Bhajan are powerful and transformational. We believe they offer all students a rare opportunity to expand their own awareness and to deepen their connection to the Divine Infinite within all. Level One trainings are foundational and comprehensive in presenting a wide range of important and supportive topics to establish the base of knowledge that every yoga teacher needs. Level Two is made up of five different modules that supports the experience of transformation; the instructor grows into a true practitioner of Kundalini Yoga. Lastly, Level Three cultivates realization through deep meditation, selfless service, and spiritual community; one becomes a teacher. We regularly offer Level One and Level Two trainings at various locations within the US and at other international locations. We are receptive to invitations to offer these programs wherever it is desired and practical. There are times when we all feel a need to find some help or support in navigating the events and feelings showing up in our lives. We feel like there should be more of something in our lives – more success, more happiness, more love. But sometimes it feels like there is some invisible block in our path. This is often caused by a conflict inside us between the image we hold of our self or a story we have created about what our life should be; and what is the reality of our life. Or there can be an experience from our childhood that has caused us to be arrested in our development, keeping us collapsing back into the conditioned response we learned in our youth that no longer serves us in our adulthood. Sometimes, we self-sabotage our dreams with attachment to specific expectations that restrict our ability to be spontaneous and adaptable to the unfolding of our life; or with a negative-minded inner voice constricting our own evolution and expansion. In my life coaching work I endeavor to listen deeply in each session to what is between the words; what is behind the language being spoken. I call on my intuitive mind to be alert to whatever is really calling out to be recognized and discussed. Using my training in Core Dynamics Coaching, my focus is to help each client develop their own intuitive strengths so that they can use their subtle sense of knowing rather than continuing to rely only on thinking. Then going deeper, I help the client to resolve or release the conditioned responses which have locked the client in a self-referenced dead-end. Using all the sensitivity I have gained from many years of meditative practice, my goal within each life coaching session is to assist the client to become fully present with themselves and embrace the natural wisdom of their own unique experience of life with joy and grace. Sessions can be scheduled as individual sessions or as part of a series. A series of sessions is usually scheduled one session per week over a period of 3 or more weeks.